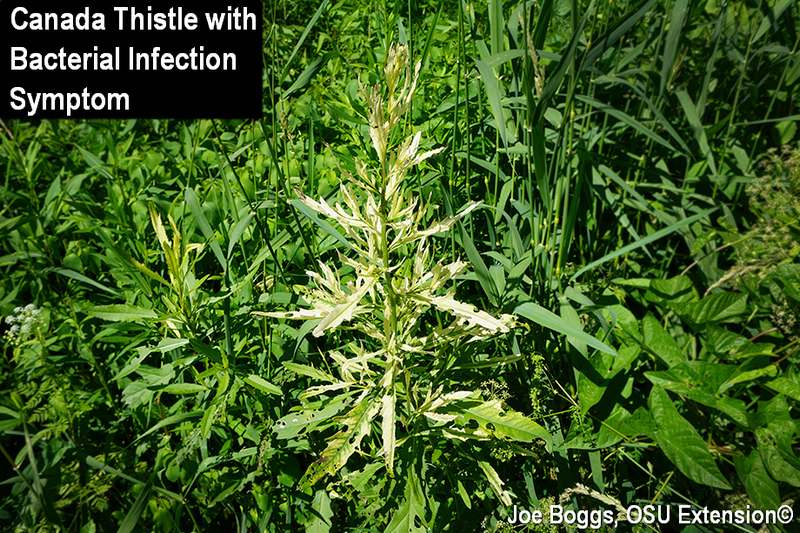 Canada Thistle (Cirsium arvense) in southwest Ohio is starting to show the "ghostly" white symptoms of infections by the bacterium Pseudomonas syringae pv. tagetis (PST). The tops of infected plants look like they were dipped in bleach. PST produces a chemical called tagetitoxin which is a RNA polymerase III inhibitor that blocks the production of chloroplasts. Symptoms could be mistaken for exposure to photosynthesis inhibiting herbicides such as triazines (e.g. atrazine) and nitriles (e.g. bromoxynil). Of course, the herbicides would tend to affect the entire plant whereas PST only affects the upper portions of infected plants and is described in the literature as "apical chlorosis." PST infections will not only produce chlorotic stems and foliage, they will also reduce seedhead production and can occasionally cause plant mortality. The bacterium received a great deal of research attention in the early 2000s as a possible biocontrol agent for Canada thistle. Unfortunately, PST has defied being cultured in a laboratory; all testing thus far has been done using extracts from infected plants. Also, even though flower head production was reduced by as much as 87% in research trials, Canada thistle is such a prolific seed producer researchers concluded that PST would not be able to overcome re-seeding by surviving plants.